If you need closet organizers to restore order to your Indianapolis, IN, home, turn to the professionals at 31-W Insulation. We’ll work closely with your family to assess your unique needs and help you design custom closet systems that perfectly solve your storage dilemmas. You can rest assured that we have the experience and the expertise needed to get the job done right, because we’ve been providing home remodeling services since 1972 and have dedicated the last 40-plus years to perfecting our craft. You can also be confident that our friendly team members will go above and beyond to ensure that you’re completely satisfied and that you receive the high level of customer service you deserve. 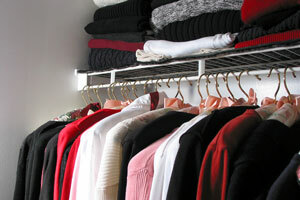 When it comes to your closet organizers, you can be certain that they’ll stand the test of time. That’s because we exclusively offer closet systems from ClosetMaid, the leader in home storage solutions. ClosetMaid’s shelving components are specially engineered to resist wear and tear so they can help your home stay tidy for many years to come. Plus, ClosetMaid’s closet organizers are available with wood/laminate or wire components in a variety of colors, so you have the freedom to design closet systems that are a true reflection of your unique taste in home décor. If you’d like more information about the closet organizers we install in Indianapolis, Indiana, and surrounding areas, contact us today and schedule a complimentary consultation. Don’t forget to ask about our other services, including the installation of simulated stone siding, shower enclosures, fireplace surrounds, and more.